The “Epiphany” we celebrate is that God revealed himself through a star. (Epiphany is from the Greek word for “reveal.”) God could have chosen any way at any time, but he chose a massive ball of gas millions of light years away to show the world that something strange and wonderful was happening. Scientists today speculate that the bright star could have been a supernova, or a conjunction—meaning that 2 or 3 stars crossed paths. Whatever caused the great light, it was so unusual that wise men (probably astronomers) traveled to find the cause. Their epiphany became the revelation of God himself. Lord Jesus, help us all to find our own epiphanies, revelations of you, today. Spend a few moments looking at the fresco image. Write down any first impressions you have. Does the image raise any questions for you? Write down what they are. What features of the image stand out most to you? The infant Jesus is radiant, and the light emanating from him washes the wall behind him and illuminates the kneeling Magi. The star, almost at the center of the image, is the other bright element, shining ten times brighter than any other star in the sky. What connection does the fresco make between the light of the star and the light of the Child? What do you notice about Mary and Joseph? What is Mary’s part in the event? What is Joseph’s part? What do they share in common? In the Incarnation, Jesus descends to us so that we might be raised to him. Here, Jesus is raised upon Mary’s lap and the Magi are kneeling and bowing in adoration. What does this image say about ascending and descending in the kingdom of God? Contrary to the human penchant for rising up and taking from God (remember the story of Adam and Eve and the forbidden fruit), the Magi came to bow down and give their treasures to Jesus. Humble worship is presented here as the antithesis of sin. Perhaps this explains in part why worship can be such work, and also why it can bring us such blessing. Who are the observers looking over the shoulders of the Magi? Why are they included in the story? infinite love incarnate, descending to dwell among us. I bow my own heart in humble praise. and wait for the touch of his hand upon my soul. He who enriches others becomes poor. He took to himself the poverty of my flesh so that I might obtain the riches of his Godhead. He who is full empties himself. He emptied himself of his Godhead for a brief time so that I might share in his fullness. What is this wealth of goodness? What is this mystery that touches me? While doing dishes in Bethany Guest House, I noticed a parade of fabricated sheep on their way to storage. Realistically-made and life-sized, they stood sentinel during Christmas and Epiphany, silently guiding the way to the manger. Sheep are not perfect and sometimes described in 3D: Dumb, Directionless, and Defenseless. Yet God gave them a prominent place at the birth of His Son. An often used biblical metaphor is that of shepherd and sheep. Perhaps my favorite is John 10:14 – I am the good shepherd; I know my own sheep, and my sheep know me. We are chosen to be humble and to follow Him who knows our greatest need. I’m not the most inquisitive person in the world and therefore, until yesterday, never questioned why Christ’s baptism is celebrated in January, just after his birth. We know from scripture that Jesus was baptized not as an infant, but as a young man, just prior to beginning his public ministry. Logically, I would have left a few months between the celebrations of birth and baptism to emphasize the age difference. I decided to research the date choice for this important feast and discovered its symmetry. There are four major epiphanies or revelations of God to man: the Birth of Jesus, which revealed Christ to Israel; the visit of the Magi, who represent the Gentiles; the Baptism of the Lord, which unveiled the Trinity; and soon to come, the wedding miracle at Cana, manifesting Christ’s transformation of the world. These four events create a perfect circle with God’s love at its center. Ordinary Time: Not so ordinary! We have just finished celebrating the feasts of the Epiphany and the Baptism of Jesus. In liturgical terms, we move into what is known as “Ordinary time” — or, perhaps more accurately — “Ordered time.” We will be here until Ash Wednesday, with much of our attention turning to preparations for Lent, Holy Week and Easter. This morning, I was looking at the upcoming chant pieces for Week II of Ordinary time. I was quite struck by the setting of three words “adoret” (to adore), and “nomini tuo” (Thy name) in the Introit. 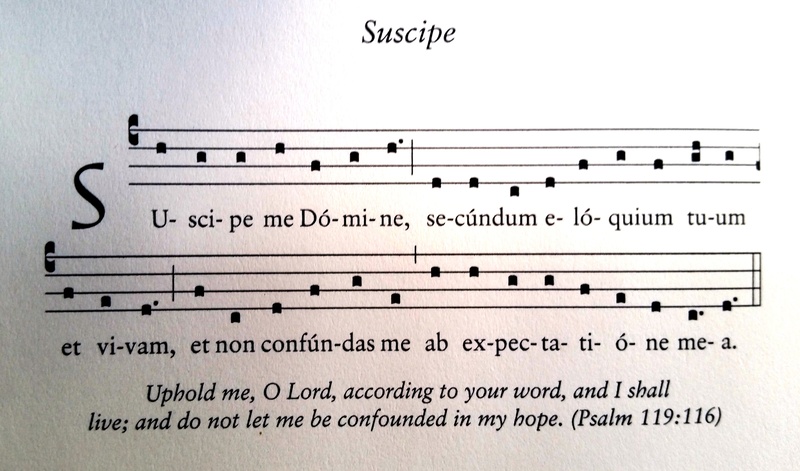 Though separated within the text itself, the extraordinary rising melodic patterns on each word seem to create an audible subtext for this chant — “Adore Thy name”. It is no mistake that these words are musically highlighted and are instantly recognizable to the ear as they rise up from their surrounding texture. How easy it would be to miss the beauty and impact of this message, and this is but one example of how the chants of these next weeks teach such basic spiritual lessons — if we have ears to hear them. It seems important to take note of this as we transition from one major liturgical season to another.